Taste test: This bag contained peanuts with a thin, crispy wheat-based shell baked onto them. The shell was crunchy, the peanuts were soft, and the combination tasted very good. 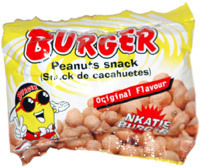 Unlike some similar prodcts, there was no special hot flavor added, so the main taste was the peanuts. This small bag quickly got emptied by our hungry tasters. Apparently "Burger" was just a name, as there were no beef-related flavors or ingredients. Smell test: Smells like fresh peanuts. 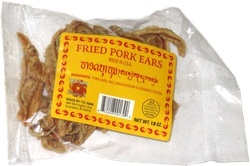 This snack was discovered by Jeremy at Albino's Market, Worcester, Masschusetts. Review published .